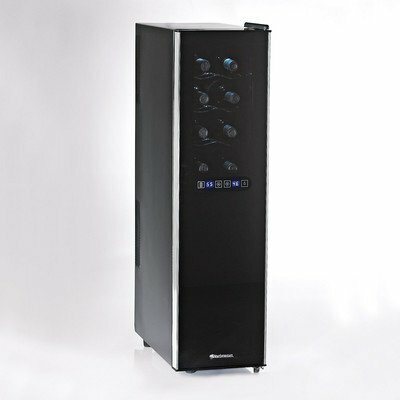 The GE Monogram Beverage Center and Wine Cooler is an essential appliance for those who love to give parties and show off their wine collection and like to add cool gadgets to their home appliances. Now the GE Monogram undercounter beverage center combines usefulness and fine elegance enhanced by latest technology features. The most uniqe feature of the GE Monogram beverage center and wine cooler is the so-called privacy door that you can set to opaque to hide the contents of the unit or clear to display the contents by pressing a button. The space between the two glass sheets of the door is filled with liquid crystals that in uncharged state are arranged randomly and block light to get inside the unit. When the door glass is set to clear the crystals are lined in a way that allows sunlight to pass through the two layers of glass. In opaque mode the door blocks out UV rays providing complete protection for your wines against these harmful rays. When set to clear the two glass panels of the door still filter out the UV light adequately. The door is with right hinge only. There’s a stainless steel bar handle which contains the button for adjusting the door window. The stainless steel frame of the door matches the stailnles steel cabinet. Opening of the door turns on the soft interior lighting automatically but it can be controlled with the internal light switch too. The GE Monogram Beverage Center can accommodate up to 10 bottles of wine and max. 126 12-ounce cans which spacious enough to entertain a large number of guests. The wine bottles can be placed on the two half-width wine racks featuring natural cherry wood fronts that can stained to match your home furnishing. The full-extension beverage shelves can be pulled out all the way providing easy access to the cans. The door opening requires 90º clearance to be able to fully extend the shelves. The 2 Spillproof Glass Shelves can be removed from the cooler. The so-called QuickSpace Shelf design allows easy placement of tall wine bottles since these shelves quickly slide out of the way. The Beverage Center has built-in electronic control panel for adjusting the temperature. The actual temperature inside the appliance is shown in Fahrenheit on the LED display. To sum up the GE Monogram ZDBT240PBS Beverage Center is a great residential beverage cooler but restaurants, bars and hotel managers looking for a good commercial wine and/beverage cooler will also find this product attractive and useful. 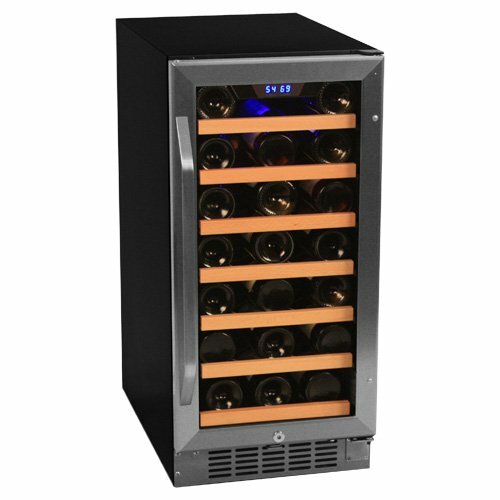 Similar products: read reviews of other Under Counter Wine Coolers. 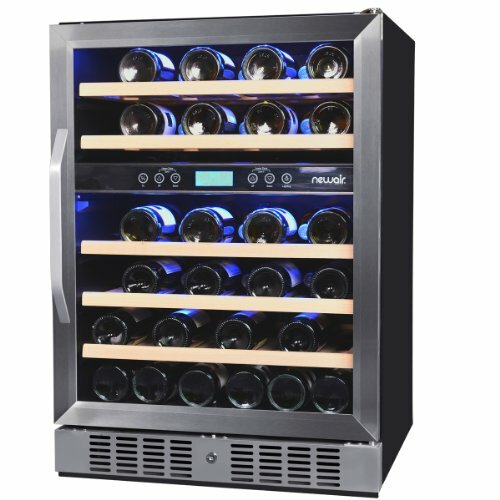 This is a zero clearance wine and beverage cooler meaning that you can build it in your existing cabinetry, without having to leave space at the back and around the sides, or use it as freestanding. The front of the unit however must be left unobstructed for proper venting. These appliance are designed for interior use only, do not place it in a room where temperature goes below 55ºF (13ºC) or exceeds 90ºF (32ºC). For an outdoor beverage cooler take a look at the Franklin Chef Outdoor Wine & Beverage Center. Price: cc. US$ 1200 – 1800. 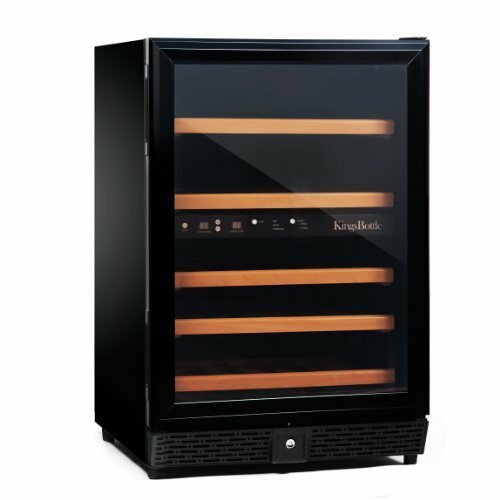 Go to our main page about GE Monogram Wine Coolers or read our overview of high end wine refrigerators. 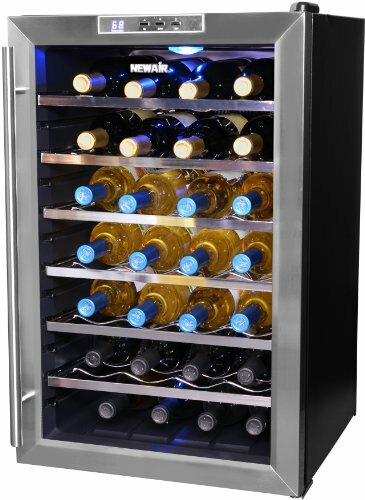 GE PWR04FANBS 29-Bottle wine cooler – a single zone freestanding unit from General Electric.